Stylish Blogger Award and Outfit of the Day! Hello guys and a warm welcome to my newest readers! 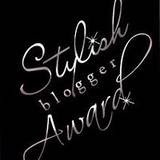 This post will be an award/tag post, as the beautiful Irene@Blushingloves and also the lovely Karen (although ages ago, sorry Karen) have both awarded me with the Stylish Blogger Award! 1. I'm not a huge fan of pink when it comes to clothes/accessories. I avoid it with a passion. 2. I'm a huge believer that the best way to spice up your outfit is by using accessories. For that reason, I try to keep my clothes as simple as possible and let the accesories do all the talking! 3. My main source of inspiration when it comes to fashion are fashion bloggers (such as Rumi, Andy and Chiara). I believe it keeps me updated better than the glossy fashion mags. 4. My fashion wishlist is always embarassingly long. For the time being, it includes 70's pieces and ethnic/boho jewellery. I 'll stop at 4, since I can't seem to think of any more right now. Nothing exciting here, just a casual outfit for uni/errands etc! Hopefully, you'll see more OOTD's in the future! Feel free to say anything in the comment section below! Until next time! Τελεια η τσαντα..κ ολο το outfit! Αλλα σε εχω βραβευσει κ εγω!! You know I love your Stylish blog girl!Congrats!!! And love your outfit!Casual outfits are my favs! !The coat is gorgeous!!! σαν σταρ του χολιγουντ εισαι ντυμενη ! !!!!! Teleio to outfit! !Latreuw tis mpotes kai th tsanta!Sugxarhthria gia to brabeio koukla!Sou a3izei!Kai sumfwnw oti ta blog einai kaluteres phges empneushs gia moda klp apo ta periodika.8a paw na dw tis kopeles pou les! Τίνα μου συγχαρητήρια για το award, αλλά τώρα στενοχωρήθηκα γιατί είχα την εντύπωση ότι αυτό αφορά μόνο fashion/style blogs, αλλιώς θα σου το έδινα σίγουρα κι εγώ! Υπόψη ότι περιμένω τα outfit posts που μας έχεις υποσχεθεί!!! Φιλάκια κούκλα! I totally agree, I'm ALL about accessorizing too! It makes all the difference. 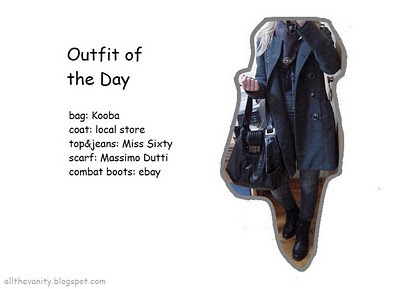 I love your outfit and I love that Kooba bag...you really need to do some more OOTD's cause you've got style!! Congrats! I love that coat on you. Great OFTD! Hey Hun! OMG wow it has been ages since I tagged you on this award LOL But it was super fun to read your style related facts. You're much closer to the fashion tastes of my younger sister than to myself...I'm more into pinks, floral prints, that kinda thing....although I do love accessories and usually try to bling it up when I go out in the evenings. I love your casual outfit to run errands. The Kooba bag is pretty and love the long coat. My casual outfits are much more boring - just sweats most of the time! Even my younger sister asked me last month "Do you ALWAYS wear sweats?! I see you in sweats all the time" LOL Oh gosh.....it's because I either make an effort to dress up a bit or none at all :P Gotta change that! congrats! also i love your outfit! What's in my bag (makeup bag included!)! December favourites are so...last year! Haus of Gloi first order!